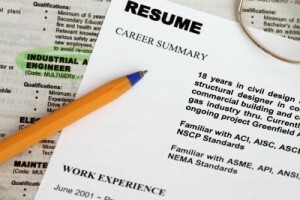 Home › FAQ › What Resources Can Be Used When Writing Your First Resume? When applying for jobs, you might have problems finding resources to be used when writing your first resume. Though resources can include websites that offer resume writing tips and the career development office at your college, resources can also refer to the information you include on your resume, what you leave off and how you format the page. Even if you only worked one job in the past or have no work experience, you can still create a functional website that catches the attention of employers. Jacquelyn Smith of Business Insider recommends that resume writers keep things simple and clean. Instead of listing references on the bottom of the page, you can either explain that you will provide the references later or leave off this section. Potential employers can contact you for this information later. Follow a simple format that places your name, address and any professional page links at the top with education and experience further down the page. Make sure you go over your resume to look for grammar and spelling mistakes as well. Finding resources to be used when writing your first resume is often hard because you have little in the way of work experience. You might find that the work experience you do have does not apply to the job too. This is the time to focus on your activities, hobbies and interests. You might list any sports you played, government positions you held in school or any positions you had in school clubs. List any clubs you joined in college as well. You never know when you might come across an employer who help found that club or was a member in the past. Employers often look over dozens of resumes in a short period of time, which means that you only have a few seconds to make an impression on them. The best way to catch their attention is with a section that lists your achievements and highlights your skills. This is where you show them why and how your skills relate to the job. List computer programs you use, the familiarity you have with different products and any skills you might have, including customer service, suggestive selling, leadership and organizational skills. When looking at resources to be used when writing your first resume, you might worry that your lack of work experience might prevent you from finding a job. As long as you fill out and format your resume properly, you can still catch the eye of employers. Even if you only worked one job in the past, list it at the bottom of your resume. Include information about when you worked, the location of the job and what you did. You can focus more on tasks you performed that apply to the job you want rather than list all the day to day tasks you handled. Whether you recently graduated from high school, just finished college or are heading back to work after taking several years off, you can still create a great resume that helps you land your dream job. Knowing what resources to be used when writing your first resume and knowing how to format your resume can help you write a great resume that shows why you’re perfect for the job.